Indian immigrants with advanced degrees could wait up to 151 years for permanent residency. A lonely 30-something Indian man living in the United States takes solace in the company of his little fluffy dog. Tied to a job that he dislikes, unable to look for other opportunities, he laments missing out on important family occasions in India because he cannot leave the country till his green card comes through. An Indian couple faces a difficult situation – the wife has to return to India on a one-way ticket as her work visa has expired. She reminds her husband quietly of the bills that need to be handled while she’s gone. Another husband slogs reluctantly in a consulting job that has him traveling five days a week, returning home to his wife only for short, weary weekends. He’s tied to his employer as he awaits his permanent residency. His wife, who holds a PhD, admits to the stinging envy she felt when a colleague from another country who applied for permanent residency at the same time as her, received the precious document within a year, while she is still waiting, uncertain when hers will arrive. In most of the striking vignettes in the documentary From The Land of Gandhi the running theme is of uncertainty, of lives in limbo. The camera follows the lives of four highly skilled Indian immigrants stuck in a permanent residency backlog. The recycling is taken out, the lawn is mowed, a dosa is cooked, a car is driven to the airport through driving rain. Behind all these little moments of middle class American life is the resounding fear that the home and country these immigrants have lived in for many years is not their home after all. They do not enjoy the full rights of residents and are unclear how long the wait will be. 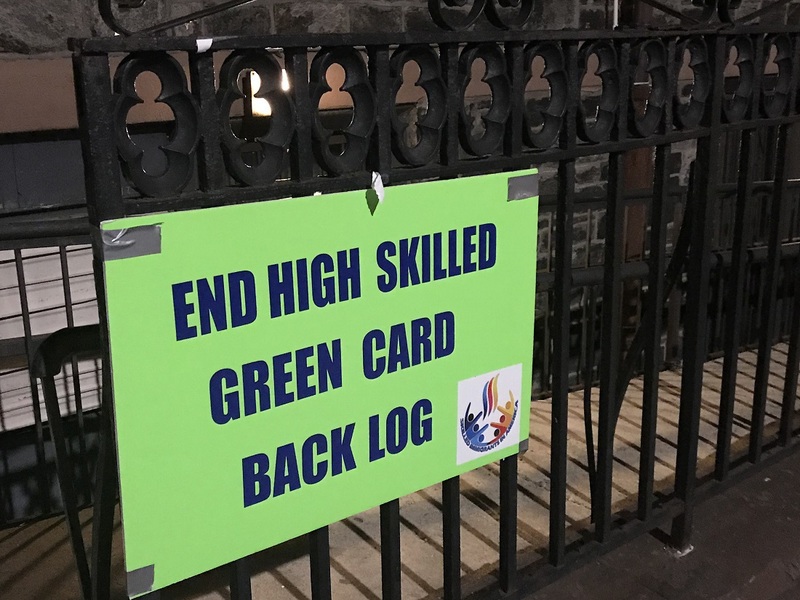 A decade after they came to study in the United States they are convinced that they’re facing discrimination in the workplace because of the seven percent country cap on employment-based green cards. Which means, regardless of the size of the country, be it Iceland or India, every country gets a fixed percentage of work-based green cards. The backlog is daunting – approximately 700,000 skilled Indian immigrants along with their spouses and minor children await green cards currently. The queue moves excruciatingly slowly, resulting in what many of these immigrants describe as suffocation of choice, the very opposite of the American dream. That suffocation echoes not only in the lives of the characters profiled in the film but also in the stories of audience members, mostly Indian or Indian American, gathered for a recent screening of the documentary in New York. Following the screening, they sit in metal chairs, cups of coffee in hand, listening intently to a panel discussion between lawyers and immigration activists on the challenges of high-skilled Indian immigration to America. They share similar problems – many of them are tied to an employer during the green card application process, often without the possibility of pay raises or growth; others cannot change careers or start businesses. Still others have had to go through painful family separations. “Indentured servitude” – that’s how Cyrus Mehta, a New York-based immigration lawyer describes the predicament of highly skilled Indians with American jobs waiting for a green card that could take anywhere from a few years to 151 years. Yes, you read that right. The Cato Institute computed estimates of the number of years it will take for Indians applying for green cards today based on data released by the U.S. Citizenship and Immigration Services (USCIS). According to their research, the biggest backlog is for EB-2 workers with advanced degrees, who might have to wait an excruciating 151 years. “Immigrants from India waiting to receive residency in the United States may die before they receive their green cards,” writes David Bier, an immigration policy analyst at the institute. But these highly educated immigrants aren’t giving up without a fight. They are hoping to spread awareness about their predicament amidst members of the U.S. Congress. They complain that their stories have been woefully ignored, underplayed or misunderstood in favor of the surge of sympathetic stories on the challenges faced by illegal immigrants. Neha Mahajan is a H-4 visa EAD (Employment Authorization Document) holder working as a television producer. Her family’s green cards were approved in 2012. “People who’ve been living here 10-15 years, it’s like you’re living the life of a nomad. There is an invisible sword hanging over your head,” she said. She’s particularly worried about her 12-year-old daughter who was two when she first arrived on American soil. By that Sameer refers to a spate of USCIS denials around H-1B amendment filings such as requests for changes in location of jobs. There is also fear that the current administration might take away the little relief that a lot of Indian immigrants hold dear – the ability of the spouse of an H-1B holder to work legally in the U.S. with an employment authorization document. This problem is peculiar to highly educated Indian immigrants – driven by a demand for technical skills; the U.S. feeds in skilled workers and students. The funnel is large at the beginning, a lot of young Indians come in and then it narrows. Highly skilled workers from other countries receive their green cards much faster. Whereas for Indians with advanced degrees – temporary status haunts them for years, even decades. The joint lament during the panel discussion at the church is that at a human level, these Indian PhD holders, doctors, engineers, MBAs are not different from their peers from other countries. Yet their ability to move ahead in the land of opportunity is predetermined by where they are born — which happens to be the second highest populated country in the world. 1. Masters Degree in US is a big hoax. Most of the students donot study in top tier colleges. How many graduate from Ivy Leagues or top tier colleges ? In reality most of the Students are average – not many from IITs study – the ones who do generally study in a top tier college (aka Sundar Pitchai, Raghuram Rajan, Vinod Khosla). Rest of the students are CRAP. 2. Most of the colleges admit international students because they are in dire needs – Funds from Federal / State has gone down drastically over time. 3. Suits the international students well as they study to migrate. Does it suit USA ? The simple answer is ‘NO’. This is happening because of Modi. He exposed you all to Trump else you people would have got citizenship. Somehow this problem is unique to Indians as it is an overpopulated country which is quite corrupt and everyone wants to get out. Naturally there is a limit to how many green cards America can welcome each year. It is time for Indians to go back to INDIA which desperately needs them having fed, clothed and housed them in their childhood and given them education. They must return to INDIA and make it a wonderful place to live. Jai Hind. Mera Bharat Mahan!! what do you mean fed, clothed and housed. If I was fed clothed and housed its because my parents did that for me not the Indian government. India is not a welfare country. It only gives little benefits to reservation category people which is also not effective for the real poor and misused by unworthy corrupt people. People like me who are in general category have to struggle to excel and fight with competition from a billion people for limited jobs and never receive any benefits of the govt and are indentured to pay taxes for their entire life for nothing. the 1% tax paying people like me pay for 99% of the non tax paying population and I am not even allowed to eat the food of my choice because I have to look which party is ruling the country and if it will affect sentiments of the ruling religion party. Why should I not think about going overseas and settling in a developed country where I will atleast get good roads and free high standard education for my kids? I feel those who have stayed in USA and paid taxes be given Green Card Straight away irrespective of which country he is Bron. It should be a rule always. This is very real guys. It is shameful for people like me who have lived legally in this country for 18 years with two masters degrees and paid taxes all my life has to still wait just because of my country of birth! Moreover, the less skilled visa category (EB3bachelors with 3 years experience which i had 15 years ago! ) is processing faster than the high skilled immigrant category for India because of the bqcklogs (in eb2). As trump says, this countrys immigration laws are a joke and a laughing stock and immensely outdated (based off 1985 immigration bill passed by clinton and bush days). The time for comprehensive immigration reform is NOW! And the time to put skilled immigration ahead of illegal immigration when talking about immigration reform is critical!! I fall in the catogory “Another husband slogs reluctantly in a consulting job that has him traveling five days a week, returning home to his wife only for short, weary weekends.” but i have just decided to load up on my education and career as no one can take that away from me!! If you are not learning, you are not growing!! No sympathy for you. You left India out of choice and probably for money. That things haven’t worked out boo hoo. Come home and enjoy the freedom of citizenship. America can survive without you and the rest of the Indians waiting in the queue bitterly complaining about being hard done by immigration purgatory. shame on you You pathetic loony. Rohan . Just because you love your father Modi, doesn’t automatically imply that everyone else should. Yes , countless people have left India for a good life and good money, good living conditions and healthcare. Face it . It is a sick country where the educated are exploited and the uneducated blithering fools bark in Election rallies and speak about gaumutra, and other stuff. it is not the fault of the educated people , if your cow-dung loving party spouts venom at every occasion . India has the wors bureaucracy, the worst politicians and the worst mindsets. What’s wrong in leaving India. And listed you as*h*l*, you didn’t pay taxes for the H1-b holders. You didn’t pay their masters degree fees. You have not even an idea regarding how tough the US Masters programme is . even if you(Rohan) are a skilled person still. you will be taking home 2 lacs per annum home. So why are you blabbering stupid nonsense. Did US President send Air Force One to pick you up from India? Why don’t you go back to your country after you got an education in USA? It’s a curse. The visa & immigration system is part of the punishment for the crime of being born in a large country. The system is broken & cannot be fixed. It’s not conducive nor fair. Abandon this land & forget the American nightmare. If I complete my master in usa then their is more chances for green card. The article throws light on the huge problem being faced by Indian immigrants working in US. The laws on this subject need to be changed at the earliest to give a level playing field to Indian workers there! The percentage of Green Cards should be in proportion to the population of the countries from where the immigrants have come. The American Dream of hard working & highly qualified Indian immigrants can only be achieved when the laws are suitably amended! America would stand to loose if the Indian immigrants decide to look for different pastures! Why are we concerned if USA loses ? Honestly Americans don’t care a damn. You should not too. You may have a vested interest of staying in USA – For yourself or your family. If anyone wants to leave USA, GodSpeed.